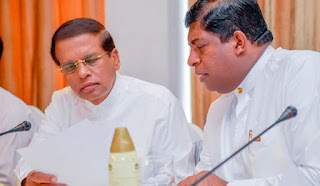 President Maithripala Sirisena had instructed the Power and Energy Minister during the Cabinet meeting yesterday (22) to carry out emergency power purchases according to the relevant procurement process. The President had issued this notification in response to a Cabinet paper presented by the Power and Energy and Business Development Minister Ravi Karunanayake, seeking approval for the purchase of 100 MW of power under the emergency purchases. The Power and Energy Minister had submitted the Cabinet paper seeking approval to purchase power within ten days of calling for tenders, it is reported. Expressing his observations, the President had instructed Karunanayake to follow the relevant procurement procedure enabling the purchasing of power within 21 days of calling for tenders.